So about a week ago the Help (the spouse) was walking around with the Helpless (the baby) and noticed a broken lock on the 1st Street side of the Florida Ave park. I told him to contact 311 and he did not find the response satisfactory, so I tweeted, and got a very satisfactory response. Keeping the park ‘safe’ is very important. Because there are a lot of little signs of the return of the neighborhood’s bad old days, I figure I should revisit the days with the Florida Ave park was a liability and not an asset. 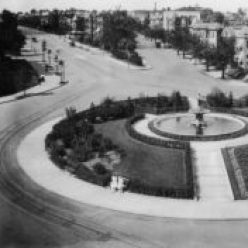 Let’s enter the InShaw time machine to 2006 and a post where the Florida Ave park is mentioned in passing. At that time the park was mainly a place where the homeless and addicts (booze & drugs) hung out. The park was open, in that there was nothing stopping anyone from sleeping there or being there at night. The problem at the time was alcoholics would go from Sunset Liquors on 1st and Florida and hang out at the park. Citizens figured if we removed the liquor store that would help clean up the park. The actual solution was making the 1st Ave side an exit only side and renovating the park. So a decade ago the park was a liability. Kids rarely played on the playground, and maybe played on the courts (depending on if bigger kids and adults allowed it). The playground was the domain of the homeless and the addicts. Parents would try to make a go of it, but finding broken glass or used needles among the wood chips or a passed out adult on the slide was discouraging. Now the park is an asset. The adults are pushed to the sides at the tables on Florida Ave or the tiny section near the exit on 1st (more on FL Ave because there are electrical outlets over there), and the kids are in the playground area, as it should be. I believe I’ve seen kids from the nearby charter school use the park during the school day. Sundays, when the Bloomingdale Farmers Market is in session, the park is filled with parents and young children. We included the park in our adoption book, as a plus. Now that we are parents, I’d like to make sure the park stays an asset, so when the Helpless is a little less helpless and can walk (or at least sit up) he can play there and expel some little kid energy. Keeping it a park where little kids can play will require vigilance and positive use. It will have to be kept secure so it won’t get misused by adults and kids will have to use it so there isn’t a vacuum that negative elements will fill. Once it becomes a liability again, it will be another problem residents will have to spend energy fighting, and a blight that will bring down the attractiveness of the neighborhood.